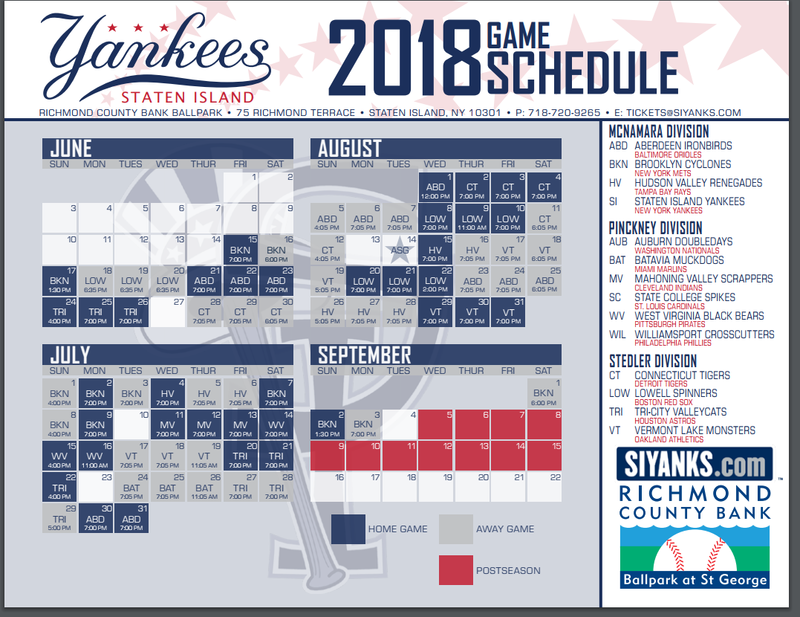 STATEN ISLAND- The Staten Island Yankees are excited to announce the team's 2018 season schedule. The Baby Bombers kick off another action-packed summer for a 20th season of baseball on Staten Island, and it all begins at Richmond County Bank Ballpark at St. George on Friday, June 15, as cross-bridge rival Brooklyn takes a trip over the Verrazano Bridge. New for the upcoming season, two of the team’s five Sunday home games (June 17 – Father’s Day and Sept. 2 – Final Regular Season Home Game) will have a 1:30 p.m. first pitch. Also new for 2018, the Staten Island Yankees host a “Businessperson’s Special” with a unique 2 p.m. first pitch on Wednesday, Aug. 22. The Baby Bombers host three Camp Days with two 11 a.m. first pitch dates (Monday, July 16, and Thursday, Aug. 9) and one noon first pitch date (Wednesday, Aug. 1). Standard first pitch times for home games are 4 p.m. on Sundays and 7 p.m. on Monday through Saturday. Gates for Richmond County Bank Ballpark open to fans one hour prior to first pitch. Along with a few new start times, highlights of the 2018 schedule include games on Father’s Day, Fourth of July, and six home contests against arch-rival Brooklyn. Fans can reserve season tickets, partial plans and group outings for the 2018 season by contacting a Staten Island Yankees ticket rep at (718) 720-9265 or by email at tickets@siyanks.com. Contact us today to reserve your tickets or for more information about the 2018 season.